The most important December decoration is your Christmas tree, without one Christmas just wouldn't be the same. Choosing your tree is a big deal; getting one the right size that looks right can be tricky, but not with our real Christmas trees! Real trees make the Christmas period extra special as they have an authentic feel about them that the artificial trees just can’t compete with. Nothing beats the look and scent of a real tree to turn your home into a charming, cosy Christmassy haven! 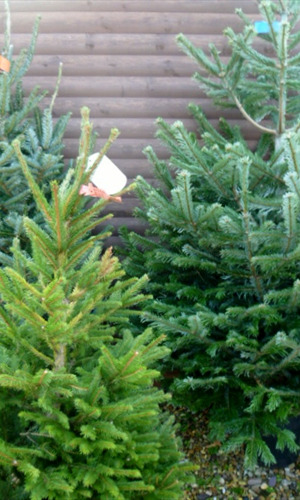 Did you know that Real Christmas Trees are grown as a farm crop, and not taken from forests? By buying a Real British Christmas Tree you are helping the farming community and the economy too. At Donington Nurseries we provide fresh British grown Christmas trees, available in a range of different varieties and sizes so that you are guaranteed to find the right tree for you. All of our trees are unpacked and netting removed on arrival ensuring that you are able to see exactly what you are buying. Our trees can be re-netted at no extra cost so that you can transport them home a little easier! We know that it is important to each of our customers that their trees remain fresh for as long as possible, which is why our main aim is to provide the best real Christmas trees around and sourcing our trees from the UK only. 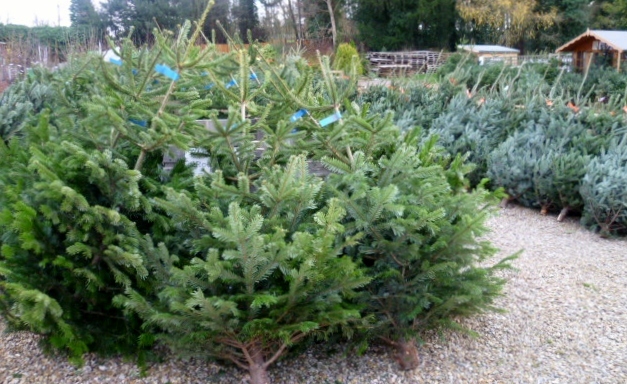 NORDMANN FIR Our most popular tree, often called the non-drop tree as it sheds few needles. It has a classic symmetrical shape, and dark green needles. FRASER FIR Another variety that sheds few needles, gaining in popularity due to its compact shape which is good for tight spaces.Has the added benefit of a gorgeous pine scent. NORWAY SPRUCE The traditional tree. Sharp needles with a pine scent and classic Christmasd tree shape. Best outdoors or in very cool rooms and well watered as these types of tree will shed needles. CARING FOR YOUR REAL TREE Your real tree needs water. Trim 2cm off the base and place in a bucket of water overnight before bringing indoors. Continue to provide it with water when in the home as you would cut flowers. We trim all bases of our trees for our customers as part of the service and sell water retaining tree stands. Place the tree in the coolest part of the room. A tree placed next to a radiator or fire, or in a very hot room will suffer. We recommend leaving your tree outside for as long as possible, the ideal time to put your tree in place is around 14th December. If you want to make this Christmas extra special then choose us for your real Christmas tree. When the time comes to go on the hunt for you tree head to Donington Nurseries and let our experienced and friendly staff help you and your family pick your perfect tree. For more information visit our contact us page or alternatively come and visit us if your in the Derby, Nottingham and Leicester area.